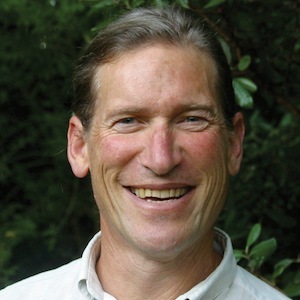 David Holmgren is an ecologist, ecological design engineer and writer. He is known as one of the co-originators of the permaculture concept with Bill Mollison. Holmgren was born in the state of Western Australia. He studied at the College of Advanced Education in Hobart, Tasmania, where, in 1974, he met Bill Mollison, who was then a lecturer at the University of Tasmania. The two shared a strong interest in the relationship between human and natural systems. While Bill Mollison travelled the world teaching and promoting permaculture, Holmgren was more circumspect about the potential of permaculture to live up to the promises sometimes made about it. He concentrated his efforts on testing and refining his brainchild, first on his mother's property in southern New South Wales (Permaculture in the Bush, 1985; 1993), then at his own property, Melliodora, Hepburn Permaculture Gardens, which he developed with his partner, Su Dennett. Holmgren started teaching on permaculture design courses in 1991 and from 1993 taught courses at his Hepburn home. Holmgren's development of a rural settlement is perhaps his most significant design and test of his Permaculture principles. The settlement, known as the Fryer's Forest Ecovillage, is near Castlemaine, in Central Victoria, Australia. Central features of the village design are, the integration of domestic forestry with selective thinning for fire-safety (the harvested wood provides energy for domestic wood stoves), and the integration of the Keyline Design system of water storage and transfer with the Village road network and residential home site location.